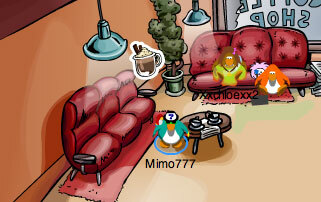 Club Penguin Cheats by Mimo777 Club Penguin Cheats by Mimo777: New Club Penguin Pin Cheat - HOT CHOCOLATE PIN! The Club Penguin updates are finally here! WHAT WERE THEY DOING? Step 1. Go to The Coffee Shop. 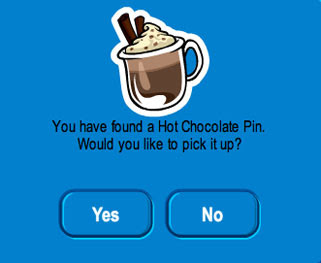 NOW YOU HAVE THE NEWEST CLUB PENGUIN PIN, HOT CHOCOLATE PIN! Hmmm, why a Hot Chocolate Pin? What could this mean? Any theories? Mimo it is winter that is why. I think the hot chocolate means-when you get cold outside(when you play on snow)you enter the coffe shp or your igloo and drink hot chocolate to warm yourself! Hot like fire! It's something to do with the fire dojo, I know it. Hot and fire go together right? CHRISTMAS PARTY!! and all the new winter events :D! Because there having the snow maze and after playing in the snow, you would want hot chocolate. Bundling up for winter, I guess. There is a BIG Snow Maze coming up. cool! thats an awesome pin! it could be. good thinkin! Why is it that almost all of the pins are in the Coffee Shop/Book Room? It seems like every other pin is there! heated by fire jitsu card thingemabobber! This is one of the better pins nowadays, not that the others are bad, this one is just better! ummm... because they ran out of other ideas for the pin? i think cp is having a hot chocolate party and there gonna have a hoy cholate/cholate pool! lol i think it will be awsome! Wow!!! Thats smart! Maybe thats it! I would say so! Good viewing! Hot like fire! It's sonething to do with the fire dojo, I know it. Hot and fire go together right? Cool! I would guess a bunch of things just not that! SMART! LOL! thats so right! thats what i was thinking when i saw it! Why is it that almost all the pins are in the Coffee Shop/Book Room? It seems like every other pin is there! I DONT KNOW! Thats cool that you thought of it! (and clever) Maybe because a lot of people go into town and go into the Coffee Shop, Night Club, Or Gift Shop! Who knows? i dont know but looks yummy!!! Well there are pins different places, but maybe it's only the ones you remember that are in the coffee shop/book room. I think most of the time they try to match it where ever it could be found like I think it was one of our missions, we had to make hot chocolate in the Coffee shop. Sorry in the other comment I just left I forgot to put CPG Mod. i think they are working a WHOLE lot on the card jitzu fire game! thats why the pin and catalog were late. I hope the new game isn't late, though. Yeah, can't wait for Christmas party stay tuned for Mimo's best Club Penguin Cheats! Yer, the Snow maze is coming soon Mimo posted a sneek peek about it also Stay Tuned for Mimo's Cheats! every time i look at this pin i feel like drinking hot chocolate.